Curd rice is an inseparable part of any South Indian meal. Its a very simple yet delicious comfort food. This is a dish that is usually eaten after the main meals. One of my friend requested for this recipe, so here you go.. Mix the boiled rice and curd together, to that mixture you add the chopped onion, green chillies and the fresh coriander leaves. In a pan heat the oil and add all the seasoning ingredients and fry for a minute (be careful as the mustard seeds will splatter once you add them to the heated oil, so cover the pan as you do so). Now add that to the curd rice. Mix well everything, check the seasoning and serve. 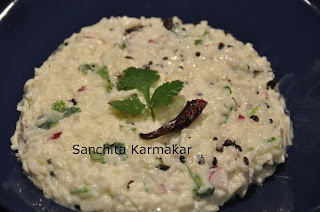 Note: If you keep the curd rice for few hours the rice will absorb all the moisture and the curd rice will become dry. You can then either add more curd or a bit of milk to get back the moisture in it. I'm the one who asked you for the recipe for curd rice. I finally managed to try it out some weeks ago. I had trouble to find fresh curry leaves, so I took dried ones. I guess they are not really comparable to fresh leaves. The asoefetida I replaced with a little bit of garlic. So with these few changes, it still tasted quite nice and I take some curd rice now and then to the office for lunch break. One question, I have though, regarding the Urad dal. Are those lentils boiled before you add them as seasoning ingredient?